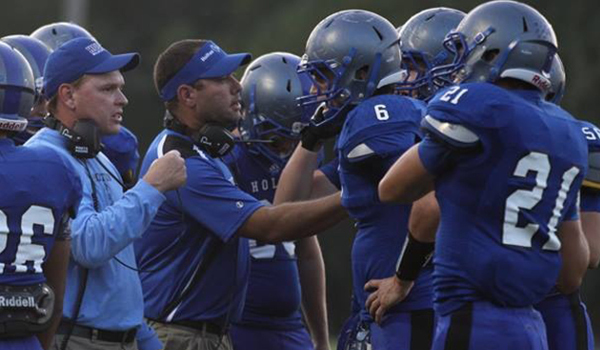 Holton coach Brooks Barta is 202-35 in 20 years with the Wildcats. He has won state championships in 2003, 2005 and 2012, taken second three times, and collected three more sub-state championship finishes. This season, Barta believed the Wildcats have never played a tougher early season schedule in his tenure. Holton lost 23-22 in overtime to 3A power Silver Lake top open the season and 20-13 to 5A’s Maize South in Week 2. Holton won at Sabetha, 14-13, in Week 3 and had a 27-13 loss to Nemaha Central in Week 5. All four squads won at least one playoff game. The loss to Nemaha Central ended Holton’s 48-game winning streak in Big Seven play. Holton moved the ball effectively behind a quintet of running backs, but made uncharacteristic mistakes and had some injury problems. The coaches sat in the locker room after the Nemaha defeat. Holton, which played the second-hardest schedule in the 32-team Class 4A, Division II, won seven straight and will play in Saturday’s state championship. The Wildcats (9-3) will face No. 1 Holcomb (10-2) at Salina Stadium. Start time is 1 p.m.
Holcomb and veteran coach Kent Teeter, who was a head coach for eight years at Hays High, six at Goodland, and now two with the Longhorns, are in their first state contest. Teeter’s son, Trey, is a four-year starter at quarterback and one of the state’s best signal callers. He has enjoyed his best season completing 151 of 223 passing for 2,404 yards with a 33/5 TD/INT ratio. Fifty-four percent of Holcomb’s offense comes via pass. Senior Christian Merz leads a bevy of wide receivers with 46 catches for 1,021 yards and eight touchdowns. Barta also coaches his son, Mason, a senior fullback/linebacker and the team’s leading rusher and tackler. Mason, like his father, will play football at Kansas State. He has 173 carries for 987 yards and 15 scores and 114 tackles. Holton averages 329 rushing yards a game with 91 percent of the Wildcats’ offense coming on the ground. Holton lost 22-21 to Columbus in the state quarterfinals last season, but delivered a 23-22 victory over the Titans in last week’s semifinal game. Holton scored on a 1-yard Barta run with 31 seconds left. Then, a Columbus offsides call moved the ball to the one and a half yard line. Barta served as the lead blocker and Spencer Baum added a two-point conversion. Holcomb, the preseason No. 2 team, never left the top-5 but went through some early season struggles. The Longhorns opened with a pair of dominant wins. Then, it fell to a pair of GWAC foes: at Ulysses, 34-20, and home versus Scott City, 15-7. Coach Teeter believed the Longhorns played well offensively versus the Tigers with 363 yards. However, Holcomb needed to improve defensively after it permitted 478 yards, including 320 to Ulysses standout running back Ian Rudzik. Throughout the years, Teeter’s teams have always struggled passing versus Scott City’s defense. Holcomb tried to run the ball but didn’t have success. On the film, the coaches noticed the Longhorns didn’t block or run routes well. Since then, Teeter said the team has practiced better, asked more questions and improved. Since Ulysses, Holcomb hasn’t allowed more than 13 points in any contest. Since the Scott City game, the Longhorns have won every game by double figures, including 48-0, 55-14 in the first two postseason rounds and 26-13 against defending state champion Andale last week. Last season, Holcomb lost to Andale, 57-13, in sub-state. Senior Braden Showalter, a cornerback last season, has moved to free safety this year and emerged as one of the state’s best defensive players. He has 67 tackles, eight interceptions, forced a fumble and recovered three fumbles. He has 184 defensive return yards.